The necklace was 3D printed in steel using ExOne’s binder jetting technology. 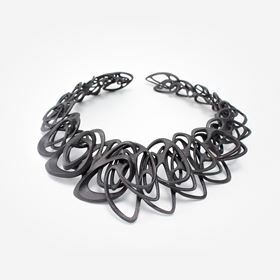 Additive manufacturing (AM) company ExOne, has produced a fully 3D printed, interlocking designer steel necklaces of its kind for the LACE by Jenny Wu jewelry line. The necklace was 3D printed in steel using ExOne’s binder jetting technology, an AM process in which a liquid binding agent is selectively deposited to join powder particles. This story is reprinted from material from ExOne, with editorial changes made by Materials Today. The views expressed in this article do not necessarily represent those of Elsevier.